Samsung delivers a delightful device in the Galaxy S5. This powerful Android smartphone offers a more refined experience than its predecessor and manages to raise the bar at least a little bit. 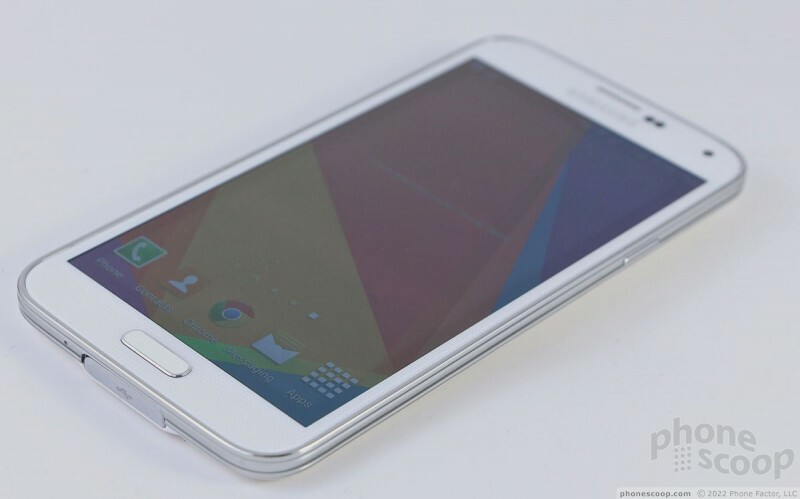 The Samsung Galaxy S5 is the Korean company's main flagship device for the next year. Samsung said it took a "back to basics" approach in designing the GS5 and assigning it features. The device is certainly an improvement over the GS4, but it's hard to recommend rushing out to the store if you already have last year's phone. Who is it for? Well, if you just have to have the latest and greatest, if you're due for an upgrade, and, most importantly, if you have a two-year-old Galaxy S III, then this is the device for you. The Galaxy S hasn't changed all that much between 2012's S III and 2014's S5. Like Apple and its iPhones, Samsung treads carefully with its main money-maker and doesn't rock the boat year-over-year. It wants to be sure the new phone appeals to those who bought the old one. That's why the hardware evolution from the GSIII to the GS4 and GS5 is minimal. 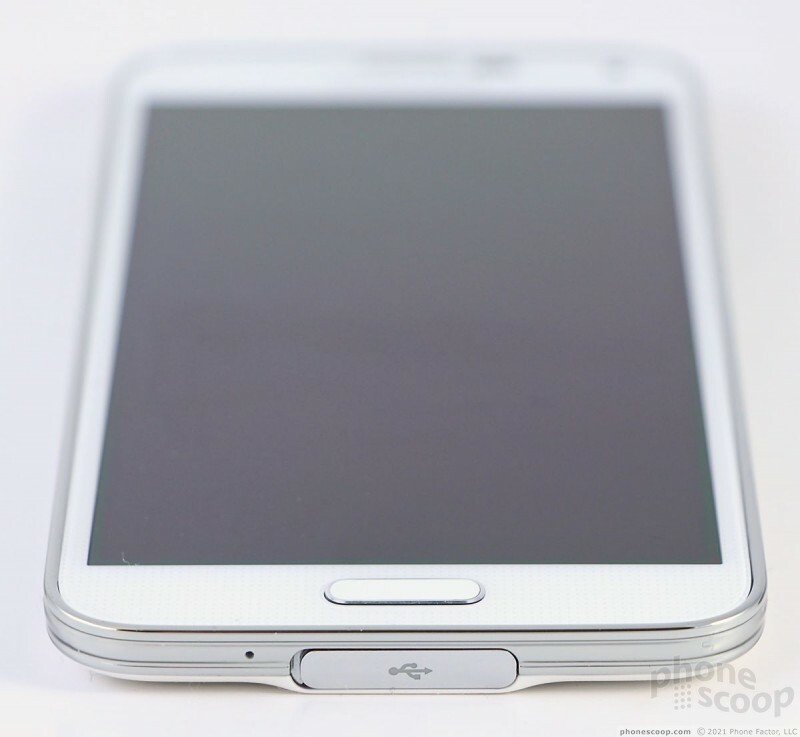 There are definite changes, but Samsung kept them low key so as not to scare anyone off. The Samsung Galaxy Note 3 may be the classiest device in Samsung's current lineup, but the GS5 is only a small distance behind it. 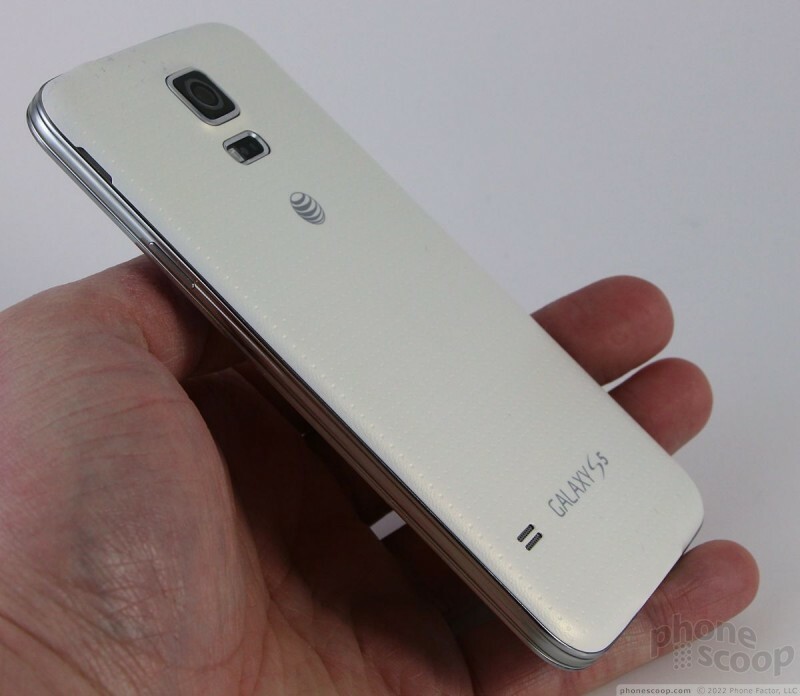 You might almost call it a Note 3 Mini. The phone uses a pleasing mix of glass, chrome-colored polycarbonate, and plastic to create the curves and surfaces. It is a clear step up from the dizzying number of mid-range models made by Samsung. The conservative color combinations (white, black, gray, chrome, etc.) are attractive in their own way. I like the way the chrome forms a rim around the front face of the device, and the patterned back panel is more appealing to me than the glossy plastics of previous models. Samsung has created a design language all its own, and that's fine. I do think Apple, HTC, and Nokia manage to make nicer hardware that's of higher quality, but there's absolutely nothing wrong with the Galaxy S5. The GS5 is a decent size, thanks to the generous display. It is wider than the HTC One, but shorter. The GS5 dwarfs the iPhone 5s and is appreciably bigger (taller and wider) than the Nexus 5. I found it mostly comfortable to hold, though the attractive chrome rim around the display also forms an irritating lip. The lip is meant to protect the screen, but it gives the front face a sharp edge that I dislike. The weight is fine, and despite the size increase the GS5 should still slip into most pockets easily. The materials and build quality are the best-ever from Samsung, but not the best I've seen. The cheap, slippery plastic back is gone, replaced by a golf-ball patterned back surface that feels much, much better to touch and hold. The phone is tightly assembled: All the seams are perfectly straight, and there's no bending or flexing of any parts. One of the GS5's whiz-bang features is protection from water and dust. This likely plays a role in its solid assembly. The GS5 carries an IP67 rating, which means it can keep water out for about 30 minutes in three feet of water (provided you firmly close the hatch covering the charge port) and it won't be bothered by blowing dust. I plunked the GS5 in a bowl of water, held it under a running faucet and even brought it into the shower. Sure enough, the claim is true. It suffered no water damage despite spending some time in the bath. Samsung is smart enough to remind people to firmly close the battery cover, which includes gaskets meant to keep water from seeping into the internal components. This is vital. If the back cover is not properly snapped on, and the microUSB hatch not securely fastened, the GS5 is not waterproof. 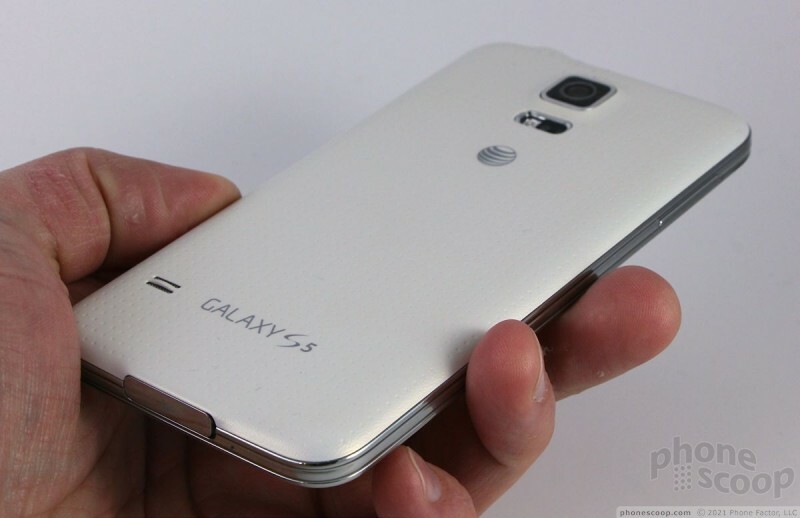 The GS5 is not rugged. If you drop it from chest height onto concrete, it's probably going to break. 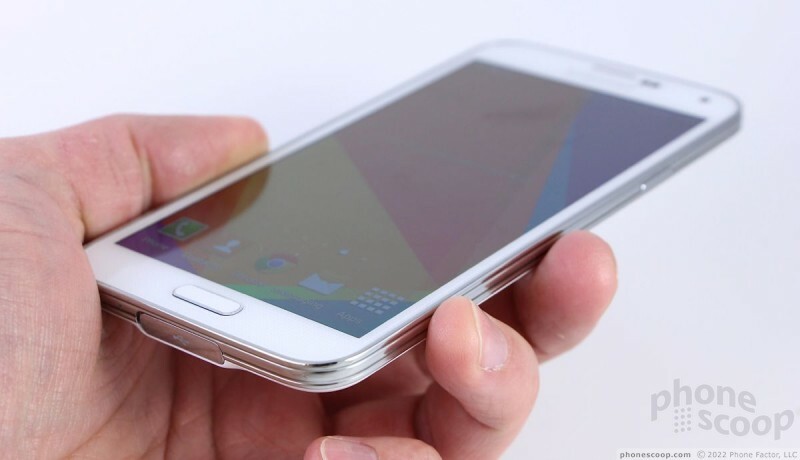 Samsung kept the GS5's bezel to a minimum. The display consumes most of the front and it isn't surrounded by ungainly amounts of additional glass. It practically runs edge-to-edge. The Samsung logo is emblazoned above the screen in silver and often catches the light. There's a slit in the glass for the earpiece speaker, which is accented in chrome, as well as several sensors and the user-facing camera. Samsung didn't stray from its long-preferred button setup. There's a single physical key below the display. It's wide, rimmed in chrome, and easy to find thanks to its perfect profile. The home button's travel and feedback is excellent. This button also doubles as a fingerprint reader (more on that later.) There's a capacitive Menu button on the left and a capacitive Back button on the right. These two buttons functioned without issue, and can be set to vibrate or not depending on your preferences. The volume toggle is positioned on the left edge of the phone. It is a short, thin strip that protrudes nicely from the side. It's no trouble to locate, and the travel/feedback are quite good. The same is true of the screen lock button, which is on the right edge. There's no dedicated camera button, which is a shame. The stereo headphone jack is on top and the micro-USB port is on the bottom. The GS5 has a USB 3.0 port that supports both the larger, faster USB 3.0 SuperSpeed connectors and the regular old micro-USB connectors you're probably used to. For some reason the device ships with a USB cable with the smaller, slower connector. The hatch protecting it requires just a bit of effort to open and close thanks to the gasket. 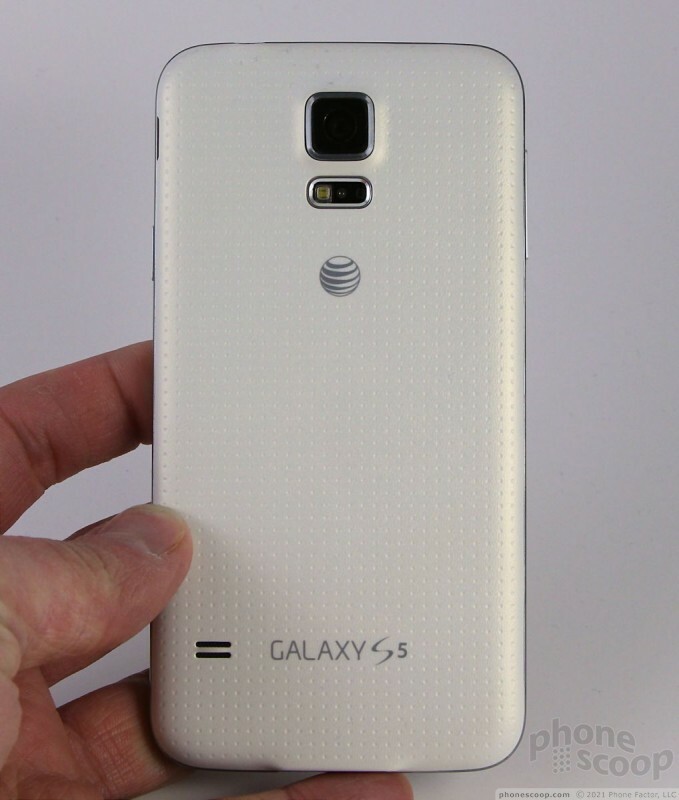 The GS5's camera module is larger than in years past and has a noticeable hump. There is a separate module below the camera in a rather deep depression. This module holds the flash and heart rate monitor (more on that later). There are a couple of slits in the plastic back panel near the bottom for the speakerphone. It's not too much trouble to remove the battery cover. The battery itself is removable, but of course it's a different size/shape than last year's battery. The SIM card and microSD memory card slots are stacked with the memory card on top. Memory cards can be removed without pulling the battery, but the battery has to be pulled in order to retrieve the SIM card. You need to be extra careful when reinstalling the back cover. Make sure all the clips are snapped in place in order to ensure the GS5 is resistant to water. 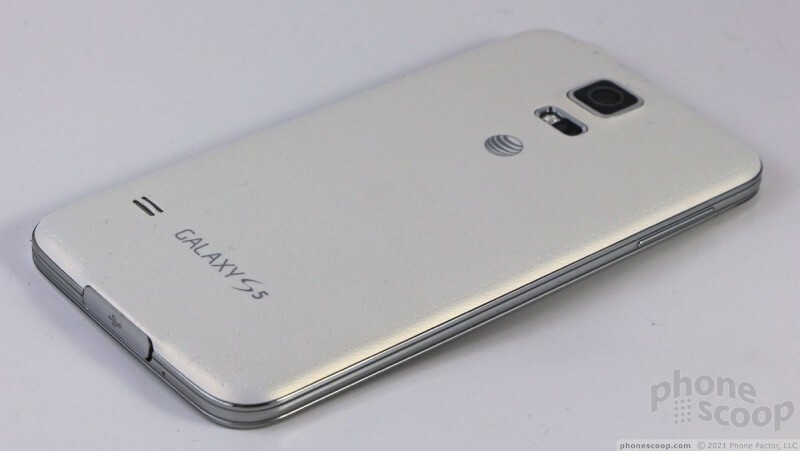 In sum, the Galaxy S5 represents the pinnacle of hardware design from Samsung, such as it is. Samsung unveiled the Galaxy S5 smartphone today in Barcelona. 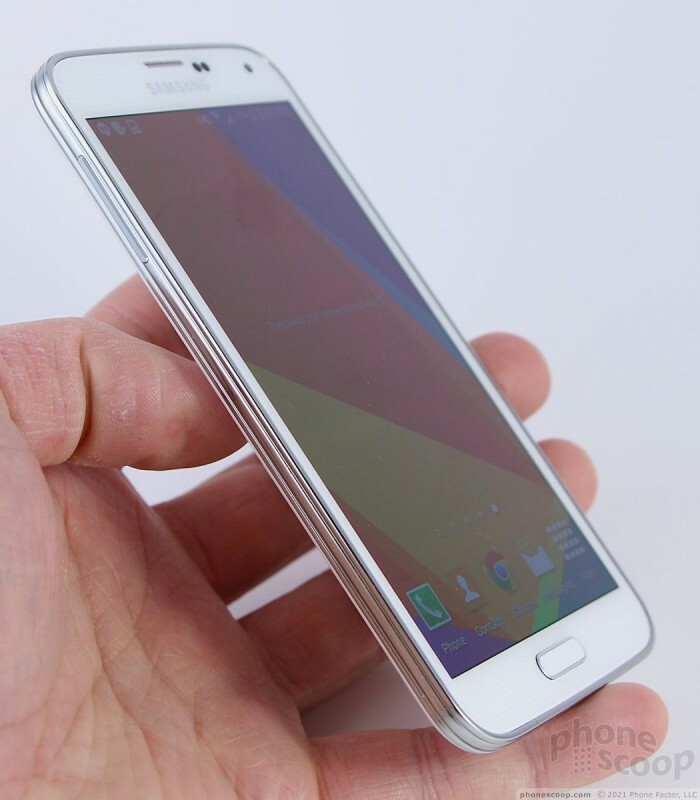 Those expecting a great leap forward are bound to be disappointed, but the Galaxy S5 makes progress all the same. Samsung's Unpacked events are always big news, usually revealing a new Galaxy S flagship, or a new Galaxy Note. 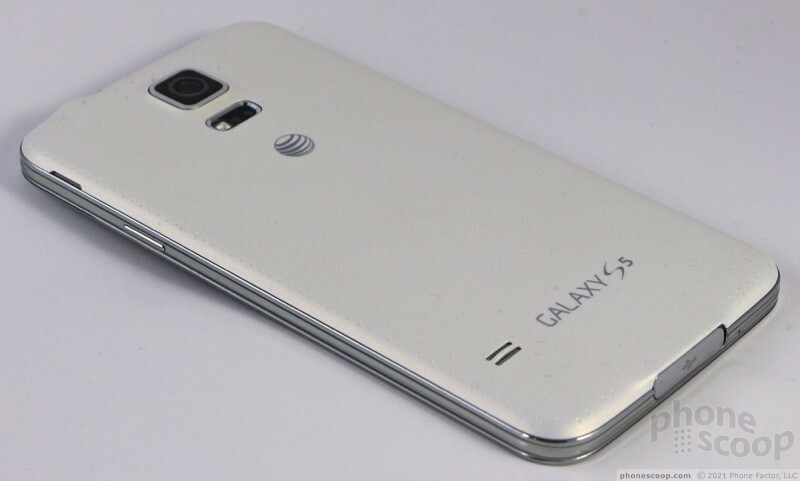 With heavy emphasis on the number five, everyone is expecting to see the Galaxy S 5 revealed. 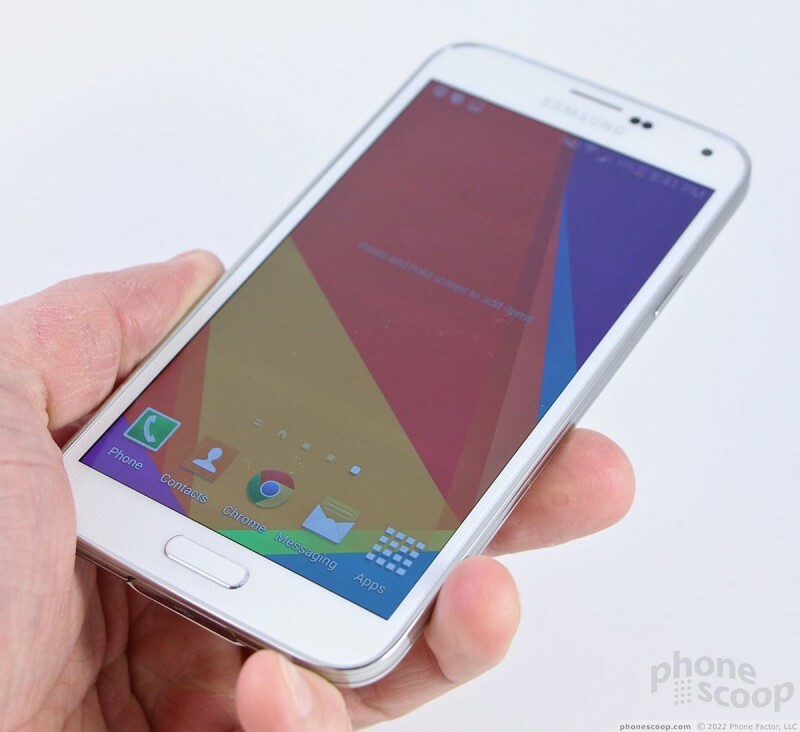 Samsung today announced the Galaxy S5, the fifth-generation of its flagship smartphone. It borrows a bit from the design language of the Galaxy Note 3 in that it is less round around the edges and more square - what Samsung calls the "modern glam look." The phone is more refined, but is also clearly a member of the Galaxy S family. Best Buy today announced the August 17 availability of an electric blue Samsung Galaxy S5, a color exclusive to the big box retailer. The blue GS5 will be available to AT&T, Sprint, and Verizon Wireless customers for $99 with a new two-year contract, which represents a savings of $100 off the normal contract price. Battery Life: Note3 vs. Galaxy S5??? Can anyone who has the S5 and experience with the Note 3 please comment on which phone has the superior battery life? I understand the difference in mAh between the phones, but what about real-world function? I'm trying to make a decision between the two and would like to go with the device with more battery life. BTW, I am not at all happy that Samsung is pushing the 16GB variants on the consumer and not offering larger 32, 64 or 128GB. So dissapointing. 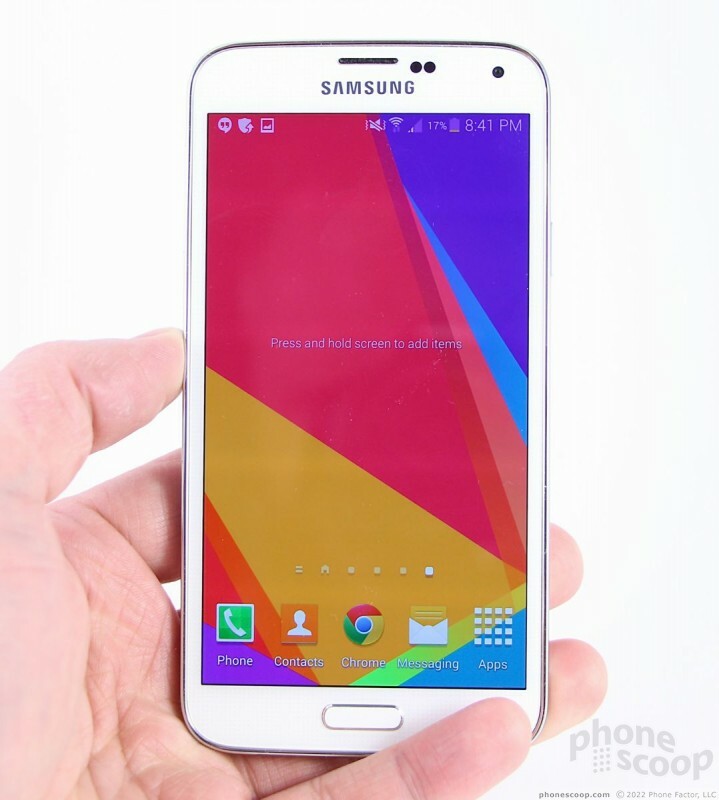 -The poor imitation of the beautiful low-poly background used by Google/Motorola that Samsung is using. So I assume you are a fanboy and just hate anything that a lot of people like. 16GB for apps is a lot of apps. The SD card support is because of Google. Lag? What Lag? For once I actually agree with this fool lol. I never thought I'd see the day. Don't know how or why Samsung would want to copy Apple...Samsung and Android have far, far more market share and sales than does Apple. In all the 27 years I've been using cellphones, the evolving technology in the last six years has caused me whiplash. Just as you purchase a phone, it seems to be outdated in six months. Nothing short of the PC era. I have always contended that rather than concentrating and exhausting all energy on non-mechanical hardware, one must use their money wisely(within their means) to purchase the most advanced device they can to prolong longevity potential. While Samsung has held back incorporating a metal fabrication in its hardware, it has been offering a very solid experience for adapting to forever changing trends or technology. Not disappointed in the Galaxy S5. Its a fine device but I still prefer the HTC ONE. Menu or Multi Tasking button? In the review it says " There's a capacitive Menu button on the left and a capacitive Back button on the right." I thought the SG S5 had a multi tasking button instead of a Menu button. Am i right or wrong? No, you're right. The actual capacitive button is a multi tasking button, but if you long press it, its still a menu button. Either way it might have just been a mental slip by the reviewer.